A stellar lineup of legendary country and bluegrass artists feature in the new “Country’s Family Reunion” series, “Another Wednesday Night Prayer Meeting.” The series features new and returning artists with new songs and stories about how God has influenced their lives. Each episode provides a great evening of sharing, worship, and stories that will warm your soul. Whisperin’ Bill Anderson and Larry Black from “Larry’s Country Diner” serve as hosts. Artists featured include Randy Travis, Gene Watson, Mark Wills, The Oak Ridge Boys, Jimmy Fortune, and John Conlee, among others. “No fake news, no lies, and no confusion,” said Larry Black. “Just great gospel hymns and stories from some of Country’s best on ‘Another Wednesday Night Prayer Meeting.’” Get the full schedule here. “Country’s Family Reunion” is hosted Larry Black alongside country legend and hit songwriter, Bill Anderson who guides the discussion and supplies viewers with inside stories from his many years in the business. Every week you're invited to spend time with your favorite country music heroes as they share the stories and sing the songs that made them famous. You will undoubtedly find yourself singing along with the classics and find yourself delighted by the stories that go hand in hand with the music. The stars speak candidly about the ups and downs of their careers and their personal lives, providing viewers the opportunity to get to know them like never before. Expect to see familiar faces like Vince Gill, Ray Stevens, Charley Pride and Janie Fricke when you set your dial to RFD-TV for this weekly one-hour program. 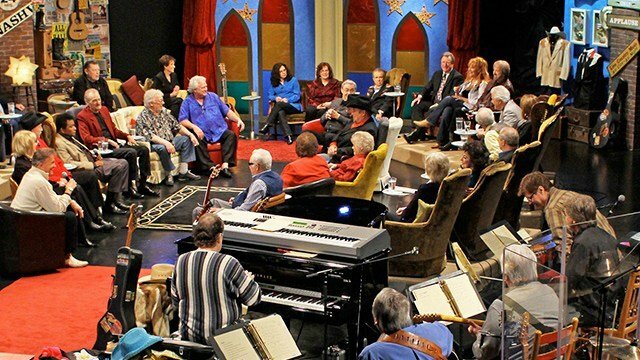 Country music history comes alive on the "living room stage" as guests relive those stories that will make you laugh or cry and sit back with the classics that will assuredly conjure up fond memories from the past. Each week "Country's Family Reunion" reunites a new group of friends together; you never know who will be in the round to share in the fun. The unique and endearing camaraderie on stage makes for entertainment you cannot find anywhere other than RFD-TV. The series is produced by Gabriel Communications, which also produces the RFD-TV series, “Larry’s Country Diner.” Owned and operated by long-time disc jockey, Larry Black, the company specializes in DVD sales, “Country’s Family Reunion” News (a monthly newspaper that highlights the music of yesteryear), sold-out theatre shows, and ocean cruises with the stars and fans of the show. Learn more at cfrvideos.com and at their Facebook page here.